Every time I have submitted my pre-built, I have been docked points because my model doesn't "look like a triangle" and all secondary structures aren't compact in placement." Does anyone have any idea what the proctor could possibly mean, especially with the triangular shape? Thanks. I think the overall structure should somewhat make a triangular shape when looking at it from the side. This kind of makes sense if you imagine the beta sheet forming the base of the triangle, and the second and third alpha helices crossing over in a way to represent the other sides of the triangle. Is this what you mean? I know that I spent a lot of time trying to get this right. Ya I think the triangle shape would be better seen if you orient the protein so the yellow beta sheet is at the bottom and the helices are on the top half. Hi, and thank you beforehand. First, Is it worth writing down "AcrIIA4 is represented with yellow tubing" or ordering of the secondary structures on the notecard? Is it okay I forgo points on the structure? TpRelic wrote: Hi, and thank you beforehand. 1. Writing the color of AcrIIA4 is good only if you have other structures in your model. Order of secondary structures is based on the model, not what you write. 2. Most of your points will be earned from having a structure as accurate as possible, which is more important than creative additions. As a general rule of thumb, if you know you'll lose points, don't just leave it like that. Try to make it the best you can. Help, we have a bit more until a week before states, and turns out I need to sub for this event and learn some thoery (I don't have to help w the actual modelling or whatever that parts about). What would you guys recommend? They linked me to a video, their notes, and khanacademy. Is there anything I need to know about this event? Knowing a ton about the amino acids and how they influence protein structure (as well as their groups ex: aliphatic group/helix breakers) is very important. Get a chart of those (groups) on your notes. AP Chem/Bio knowledge is important (in the areas that relate to this). And finally the prebuild and onsite will be hard if you don't know how to use the program. 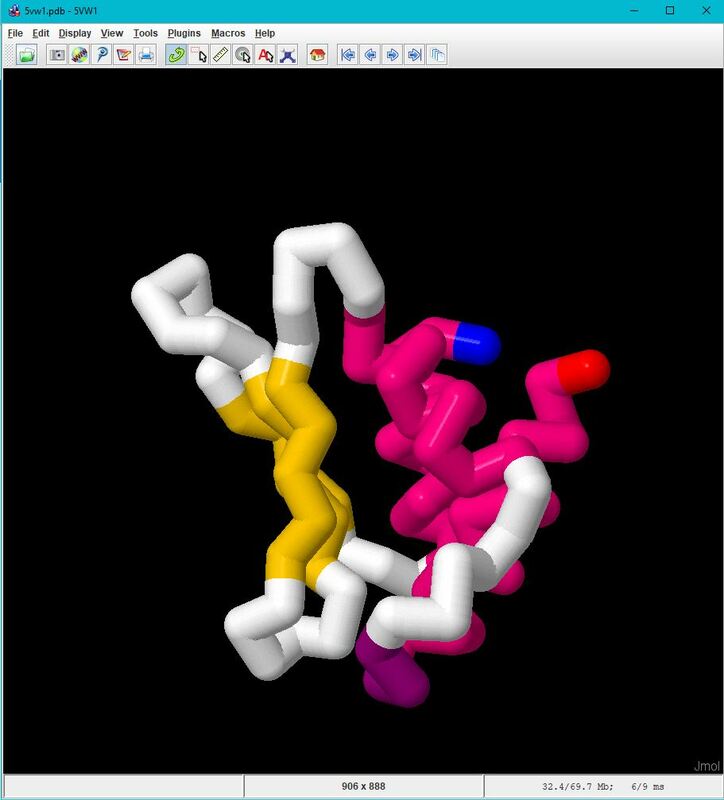 Watch some tutorials, and this :https://chemapps.stolaf.edu/jmol/docs/?ver=14.22#colormodelobject can be useful (but only once you've watched some tutorials as its mainly just a documentation of commands). Dynamic Planet Protein Modeling, Thermodynamics, More to (hopefully) come! It has a lot of information, and is great especially since you're just starting. huppada wrote: I think the overall structure should somewhat make a triangular shape when looking at it from the side. This kind of makes sense if you imagine the beta sheet forming the base of the triangle, and the second and third alpha helices crossing over in a way to represent the other sides of the triangle. The entire time I thought it meant to make the three helices form a triangle so that’s what we made the model look like at every competition.